You can transform a child's life with your giving. Every gift up to $1 million will be matched dollar to dollar by Laura and Gregg Perloff, doubling your impact. Your donation will help create a permanent endowment for the Jared Kurtin Music Therapy Program at UCSF Benioff Children's Hospital Oakland ensuring that children and teens can forever benefit from this life-changing therapy. Music therapy is supported entirely by generous donors like you. Please give today! Why is Music Therapy Important? Music therapy is prescribed for children who are unable to verbalize their feelings, fears, or concerns by providing resources to cope with their illness, hospitalization, and treatment. Music brings the mind, body, and spirit together and can be transformational. Read Rokie's story or listen to Kimberlee’s song to learn more about the healing power of music. Certified music therapists work with patients and their families to explore physical and emotional challenges associated with treatment or trauma. This is accomplished through playing, listening, or creating music. What is Music Therapy Exactly? 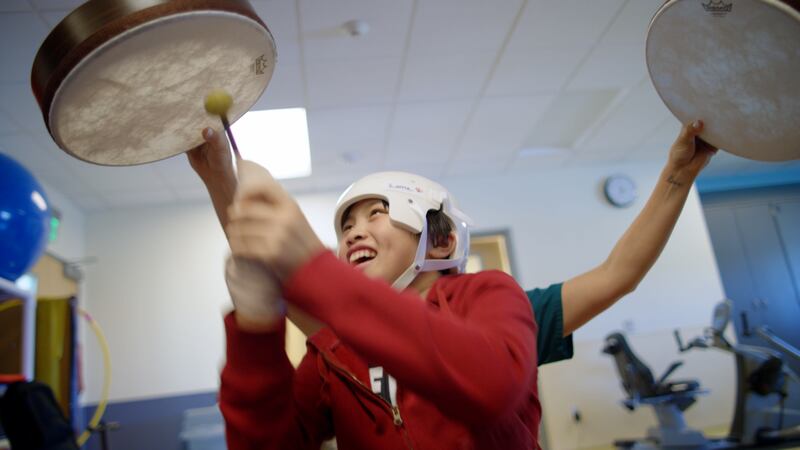 The Jared Kurtin Music Therapy Program at UCSF Benioff Children’s Hospital Oakland is a clinical evidence-based intervention that supports a patient’s physical, emotional, and cognitive well-being. Our three music therapists are an integrated part of the patient care team and work closely with doctors, nurses, and other therapists. Bedside and group sessions help children and their families cope with illness, trauma, and hospitalization. A typical session might include music improvisation, therapeutic drumming, song writing, or music-assisted relaxation. Children choose to play, sing, direct or simply listen. Research on the medical benefits of music therapy is also a priority of the program, as findings will help influence insurance reimbursement rates and increase the usage of this important type of care. The music therapy team is also focused on training the next generation of music therapists through their internship program. If you have questions, or would like to make a special gift, please contact Amelia LaPlante at (415) 502-6225 or amelia.laplante@ucsf.edu.